I admit I haven’t have experience with Korean arcade parts, but I start a loose guide listing of what I do know and let people discus about Korean parts and maybe we can build up a half descent database. I will reference the old [THE ULTIMATE KOREAN ARCADE PART FAQ!! ](The Ultimate Korean Arcade Part FAQ! to flesh thing thread out. What was noticed in the Tech Talk community is that many of the old Korean arcade part threads are dead and many threads have broken images, broken links, out of date and inactive. Special thanks to (but not limited to) the following forum members (in no particular order) who ether helped me directly or those who contributed to older threads (even indirectly) which I tried to use to build this one. With every particular style of arcade parts, there is certain design elements or conversions that follow each style. As we already know the words of difference between American/European and Japanese style parts are. Japanese parts are designed to be fitted into thin metal panels while American parts are intended for thicker wooded panels. Korean parts tend to follow their own conventions which have similarities and differences from other styles. With few exceptions, Korean joysticks can’t mount properly in the typical Japanese joystick mount. As there usually a raised collar or neck that sticks above the top panel of a arcade controller. There might be other manufacturers that could pop up but for joysticks at least we focus on those for now. Korean sticks usually have no springs or restrictor gates. Unlike more typical American or Japanese style joysticks, Korean joysticks use a rubber (or similar material) grommet to center the joystick shaft or lever. For those who remembered the old American style part manufacturer Wico also used rubber grommets. Even then there is different harnesses for the rubber grommets, labeled soft, medium and hard. Korean sticks used individually tabbed microswitches or leaf switches, a .187 quick disconnect wiring or a .187 quick disconnect to a 5 pin JST E adapter is often used. Help! Can a Crown CWJ 303n Fit into a Hori RAP 4 KAI? Considered the lesser of the 3 big manufacturers until recently when they expanded into the home “fightstick” market (I hate that term, Fightsticks). First of the Korean Joysticks to be compatible with Japanese style mounting. Comes with a Ball top instead of a bat top on the lever (not removable). 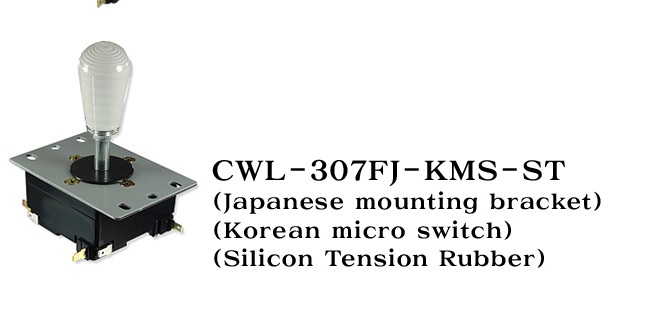 Coming in both Korean mounting and Japanese mounting variations the Crown CWJ-307 is also the Official Tekken 7 Joystick. Myoungshin Fanta joysticks are one of the popular Korean style joysticks out there. Although many of their joysticks parts are interchangeable with Taeyung Fanta joysticks, they are two separate companies with different molds for their plastic parts. Although many of their joysticks parts are interchangeable with Myoungshin Fanta joysticks, they are two separate companies with different molds for their plastic parts. Most of the Saulabi sticks used cheap knock off parts and often buttons soldered to the PCB. Metal case Arcade stick developed by eTokki. Comes in Korean or Japanese parts, we focus on the Korean version. Built with Myoungshin Fanta stick and Crown CWB203A buttons, the stick uses the PCB from the Joytron Paewang Revolution. One of the first sticks to support support both the PS3 & Xbox360 straight out of the box. The parts are knock offs of Japanese style parts. The default button hole size fits crown buttons. its semi-common for people mount the Sanwa JLF inside, but I seen mods that allow for a Fanta joystick. Be prepared for a hack job, alot of cutting, filing and desoldering. The stick is more valued for it’s PCB than everything else. Recently the PS360+ board has taken over the role the Paewang had filled. The KE uses a Crown CWJ-303FK as its joystick and Sanwa buttons. The KE is the only arcade controller that been sold retail in the United Sates that ever offered Korean Parts. Designed to fit 6mm threading Japanese Ball tops and Bat tops (10mm bat tops will need the bat top adapter). The Shaft is hollow to allow for ball top lighting. Used to easily wire a Joystick with .187 terminals (or tabs) to a 5 pin joystick wire harness. I’m a bit surprised you still haven’t tried a Korean lever, though you may strongly dislike them given your stated preference for the “operation” method of play. My experience is admittedly limited to the 303-FK at this point, but they’re pretty cool in their own way. Very unique, worth trying IMO. Kind of an in between compromise between old American style parts and Japanese levers with its own flavor, quite satisfying to throw around. For Tekken 7, I believe the official variant used is the one with the silicon rubber grommet (ST). You don’t really seem to miss anything from the official manufactures, there is a completely different marked for k-sticks. They change the latex rubber to a silicone rubber, and use Thailand micro switches and support the switches underneath and on top of them. The Myoungshin Fanta Airbag is the golden standard for top players in korea. Infiltration, JDCR etc. etc. uses this version. Thanks Darksakul for reincarnating the old Korean part FAQ and giving us a place to discus theese often misunderstood arcade parts. Kkolding nice pictures of the “myoungshin fanta airbag” first time I have ever seen this mod. Anyway to buy one of these Fanta Airbags? Just a quick reminder. You can use balltops with the Myoungshin Fanta and maybe with Crown too, just replace the shaft with a regular shaft from Sanwa and voila! It’s not possible to buy them if you don’t live in Korea, they don’t ship internationally. but send me a PM, and we might be able to figure something out. Yeah, it not the same since the extra length of the battop helps to play a lot better. But still an option for those who are more used to play with balltops. There some universal facts about Korean sticks. Korean sticks don’t use any springs. They use a rubber pad to bring the stick back to neutral. The thickness or stiffness of the rubber is mostly responsible for the strength of the stick. Korean sticks all have bat-tops, aka american-lookin knobs but only smaller than American knobs. Probably the most well known Korean stick is the Fanta stick. There’s something most people DON’T know about when it comes to Fanta sticks is that they’re two different manufacturers. The two companies are totally unrelated and their sticks just happened to be called with the same name. The kind of Fanta that I’ve been selling are the MyoungShin Fantas (aka new Fantas). These sticks have a short knob and a smaller throw. They work well for both 2d and 3d. The possible colors for the knob are green and red. Black is getting super rare. The newer batches of these new Fantas have been coming out with Deco switches. Well they’ve very recently been making sticks with a slightly different model of Deco switches that give the unique clickly springly feel and sound that Gersung switches give. Now, sticks with either Gersung or Deco switches seem about equal in performance. The Fanta made by the other company (who actually had the name first) is TaeYoung. These Fantas are what most Korean tekken players took to evo to play with. That includes KBM, MDJ and others. Some og cali tekken players also have these wooden Korean sticks with a handle on the side and a latch so that you can open up the case and store your cable and stuff. Those wooden sticks also had these old Fantas in them. The main characteristics are that they have a taller knob, slightly bigger throw, hella strong rubber that takes a long time to break in (most people remember this), and the surface of the knob has some anti-slip texture to them unlike the new Fantas which are shiny smooth. Good for both 2d and 3d. Colors come in green and red.